The bet that many investors made last year that the U.S. financial sector was heading higher seemed to have a lot going for it. The shares of banks and insurers were trading at “cheap” levels relative to earnings and book values. The Federal Reserve was moving toward policy normalization, indicating that the relationship between short- and long-term interest rates would return to where it was before the financial crisis struck, potentially allowing lenders and other intermediaries to boost returns. The regulatory heat appeared to be cooling as Washington turned its attentions elsewhere. And finally, the sector was somewhat out of favor, suggesting that underweight institutions might scramble to increase holdings once upside momentum returned. And yet, despite all the positives, things have not gone well for this group, especially over the past six weeks. The KBW Nasdaq Bank index has dropped 18.5% since 2016 began, lagging the 8.8% decline in the S&P 500 index by nearly 10 percentage points. The KBW Nasdaq Insurance index has also fared poorly, losing 11.1% over the span. In many ways, this unexpected turn of events is an apt reminder of why the so-called fundamentals don’t offer a fail-safe method for picking winners. As has been seen time and again, particularly during the past seven years, investments that eventually perform best are not necessarily the biggest bargains when assessed in traditional terms. In fact, one popular–and lucrative–strategy last year was to invest in a small group of large cap technology stocks–the FANGs, comprised of Facebook, Amazon, Netflix and Google–which, by some measures at least, did not represent good value. But even during more ordinary times, wagering on stocks because they are inexpensive based on one measure or another, especially when there may also be some sort of positive catalyst involved, is not necessarily enough. If history tells us anything, it is that the notion of “value” is something of a moving target. A stock trading at 15 times 12-month forward earnings estimates, for example, could be considered rich or cheap, depending on whether the prospective P/E ratio is higher or lower, respectively, than its historical average and the broad market equivalent. Moreover, when it comes to market-moving developments, there are any number of drivers that can impact a sector or stock. While it is undoubtedly true that the historically normal situation where long-term rates are higher than short-term counterparts is good for lenders–who, in the U.S. at least, tend to finance corporate and other loans through demand deposits, certificates of deposit and other short-maturity instruments–there is more to their bottom-line success than net interest margins alone. One error that many financial sector bulls made in wagering on a rising NIM was that it would, in fact, come about. While the Fed did initiate a tightening cycle in December, evidence suggests that they might have done so for the wrong reasons or, perhaps, acted too late. That is because, as noted in “Economic Risks Are to the Downside,” conditions are proving to be less robust than many thought, which means the prospect that the Fed will forge ahead on the course it began in December is looking shaky. Already, interest-rate markets seem to be reflecting this fact. Instead of the yield curve steepening–where the difference between long and short rates increases–the opposite has held true. 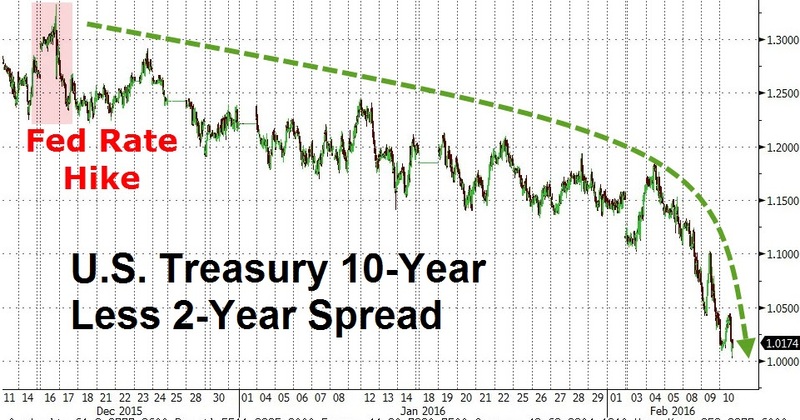 For the first time since 2007, Zero Hedge notes, the spread between 2-year and 10-year U.S. Treasury yields has declined toward 100 basis points. Historically, a flattening trend has often been the precursor to an economic downturn. Another reason why a positive outlook for the sector was not necessarily a reason to dive in was because the ranks of bullish believers had grown significantly since the idea was first floated that the Fed was seeking a return to normal. While the central bank dithered for months in initiating the first step, speculators and some longer-term investors had, since early last year, piled into U.S. bank and insurance shares in anticipation that the policy shift would eventually occur. By the time December rolled around, it was almost a given that normalization would be a windfall for the sector. When the Fed acted, however, the event turned out to be a case of “buy the rumor, sell the fact.” With so many investors, most notably hedge funds and leveraged traders, positioned the same way, the lack of immediate upside follow-through was all it took to trigger a rush for the exits. But it wasn’t just the fact that sentiment towards the group had become increasingly positive. Aside from concerns about the health of the U.S. and global economies, the deleterious impact that falling oil and other commodity prices was having on the financial condition of various entities, including energy companies and emerging market borrowers, meant that creditworthiness, a factor as important to the lending business as margins, was becoming problematic. While many financial institutions maintained that they had made adequate provisions against losses and were relatively immune to concerns that roiled high yield bonds last year, markets have been saying otherwise. With credit default swaps–a form of insurance on the creditworthiness of borrowers–on banks surging higher, it seems that their asset values and earning power were being called into question. Some would also note that the technical tea leaves were also signaling caution before reports emerged that various economies and borrowers might be in trouble. After hitting its highest level since 2008 in July, the KBW Nasdaq Bank index reversed course and began to lag the broader market. After the Federal Open Market Committee raised rates in mid-December, both the absolute and relative trends accelerated to the downside. Other factors have also come into play. With the U.S. presidential election season moving into high gear, politicians are once again singling out banks as easy populist targets. Meanwhile, there are growing concerns about the impact that zero and negative interest rates will have on lenders based overseas, creating problems for others, including U.S. institutions, that might do business with them or tap the same markets they do for financing or risk management. The point? Just because an investment makes sense from one perspective doesn’t necessarily mean it makes sense overall. If it seems unusually cheap, then maybe there is a good reason for it. If it seems like the environment is positive, then it might be a good idea to ask what can go wrong. If something is not working as expected, then maybe expectations need to be questioned. Like the old cliche says, if it seems to good to be true, it probably isn’t.